We are pleased to present ins2outs version 2.2.0. The following new functionalities are delivered to you with this version release. 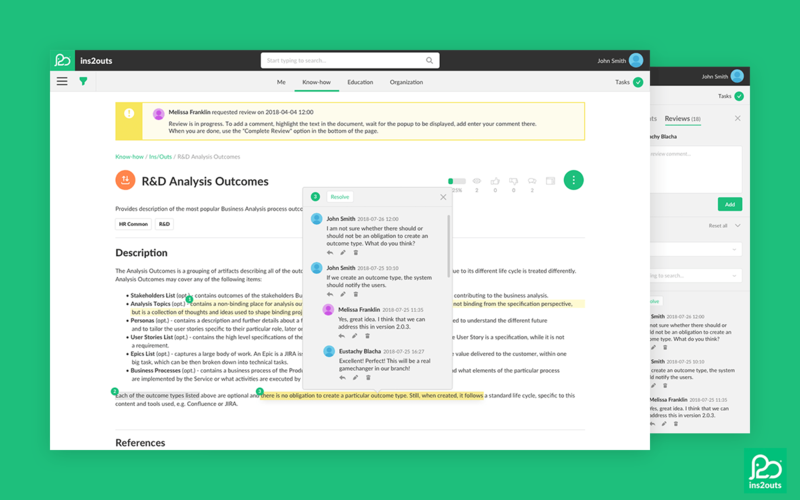 Following feedback from our customers, in version 2.2.0 we introduced functionality to add review comments without the need to edit a content. It is possible, after starting a review, to add multiple review comments either within a content page or in the Review panel on the right hand side of the page. When the review is completed, the requester of the review is informed about that via e-mail. The review comments can be then browsed and resolved individually in the panel on the right hand side. The panel is accessed by clicking Comment icon in the upper right corner. The history or resolved review comments stays in the system. There were following issues and bugs fixed with this version release.